Expenditure on healthcare in Romania reached RON 35.2bn in 2015, according to data provided by Eurostat. Total expenditure on healthcare was equal to 4.94% of GDP in that year. The Romanian healthcare sector was characterised by the lowest per capita expenditure in the EU, which stood at EUR 400 in 2015. Romania has one of the EU’s worst performing healthcare systems, due to insufficient funding, which is resulting in an expansion of the private sector. Despite the expansion of private healthcare, however, government schemes and compulsory contributory healthcare financing schemes accounted for 78.03% of total healthcare expenditure in 2015. 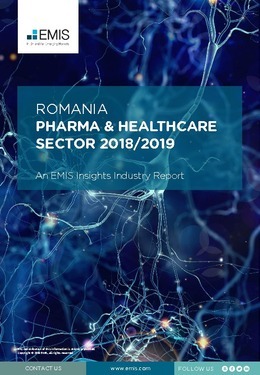 The Romanian pharmaceutical sector is one of the largest among the CEE and SEE countries. In 2016, the output value of the manufacture of basic pharmaceutical products and pharmaceutical preparations reached EUR 670.3mn, a fall of 11.8 y/y. The low prices of pharmaceuticals in Romania result in re-exports and parallel exports, which together make up a significant share of foreign trade. This report provides a complete and detailed analysis of the healthcare and pharmaceutical sector for [country name] . EMIS Insights presents in-depth business intelligence in a standard format across countries and regions, providing a balanced mix between analysis and data. Build a clear picture of trends and issues for sub-sectors (medical institutions, pharmaceuticals manufacturing and distribution channels).